Wild Carrot (Daucus carota) is a dicot weed in the Apiaceae family. In Ontario this weed first evolved resistance to Group O/4 herbicides in 1957 and infests Roadsides. Group O/4 herbicides are known as Synthetic Auxins (Synthetic auxins (action like indoleacetic acid)). Research has shown that these particular biotypes are resistant to 2,4-D and they may be cross-resistant to other Group O/4 herbicides. Whitehead, C. W., and C. M. Switzer. 1963. The differential response of strains of wild carrot to 2,4-D and related herbicides. Canadian Journal of Plant Science. 43 (3) : 255-262. Also Switzer, C.M. 1957. The existence of 2,4-D resistant strains of wild carrot. Proc. N.E.W.C.C. 11:315-318. L. L. Van Eerd, G. R. Stephenson, and J. C. Hall. 2000. 2,4-D resistance in wild carrot (Daucus carota). Weed Sci. Soc. Am. Abstr. 40:64. 2,4-D resistant wild carrot populations were first reported by Switzer in 1957 (see Switzer, C.M., 1957. The existence of 2,4-D resistant wild carrot. Proc. N.C.W.C.C. 9:75-77). Greenhouse trials comparing a known susceptible Wild Carrot biotype with this Wild Carrot biotype have been used to confirm resistance. For further information on the tests conducted please contact the local weed scientists that provided this information. There is no record of differences in fitness or competitiveness of these resistant biotypes when compared to that of normal susceptible biotypes. If you have any information pertaining to the fitness of Group O/4 resistant Wild Carrot from Ontario please update the database. The Herbicide Resistance Action Committee, The Weed Science Society of America, and weed scientists in Ontario have been instrumental in providing you this information. Particular thanks is given to Chris Hall, and Clarence Swanton for providing detailed information. Nelson, E. A. ; Penner, D.. 2005. Sensitivity of selected crops to isoxaflutole in soil and irrigation water. Weed Technology 19 : 659 - 663. Isoxaflutole, a preemergence herbicide for use in maize, causes bleaching of plant tissue and plant death at low rates. A concern regarding widespread use of isoxaflutole is the unintentional exposure of high-value, minor hectarage crops that may be sensitive. Unintentional exposure could occur because of carryover from a previous application, spray drift, or contamination of irrigation water. The objective of this study was to determine the potential for injury to nine minor hectarage crops grown in Michigan, USA. The crops evaluated were: adzuki bean (Vigna angularis), lucerne (Medicago sativa), carrot (Daucus carota), cucumber (Cucumis sativus), dry bean (navy and black beans; Phaseolus vulgaris), onion (Allium cepa), sugarbeet (Beta vulgaris [Beta vulgaris var. saccharifera]) and tomato (Lycopersicon esculentum). Experiments were conducted in the greenhouse to evaluate injury from low rates of isoxaflutole applied to soil to simulate carryover as well as low concentrations of isoxaflutole in 2.54 cm of irrigation water applied over the course of 1 h to 15-cm-tall plants. Isoxaflutole rates and concentrations that cause 20% injury (I20) were calculated using Seefeldt's log-logistic dose-response model. Regardless of the application type, onion was always the least sensitive plant to isoxaflutole (I20=37 g/ha applied to soil and 194 µg/litre in irrigation water), whereas navy bean and black bean were the most sensitive (I20=9 g/ha applied to soil and 5 µg/litre in irrigation water). The remaining plants exhibited intermediate sensitivity. All of the rates that resulted in injury were substantially less than the rates used for weed control in maize. Carryover from isoxaflutole applications in maize production may require plant back restrictions for certain sensitive crops..
Saint-Louis, S. ; DiTommaso, A. ; Watson, A. K.. 2005. A common ragweed (Ambrosia artemisiifolia) biotype in Southwestern Québec resistant to linuron. Weed Technology 19 : 737 - 743. The degree of resistance to linuron of a common ragweed (Ambrosia artemisiifolia) biotype was investigated. Suspected linuron-resistant plants collected from a carrot (Daucus carota) field near Sherrington, Québec, were subjected to increasing rates of linuron under glasshouse conditions. Resistance to linuron of the common ragweed biotype was suspected because 33% of plants survived to reproduction after they were sprayed at a rate of 4.5 kg/ha, two times the dose rate recommended for linuron in carrots, and also because 3% of plants survived to reproduction after they were sprayed at a rate of 22.5 kg/ha, 10 times the recommended dose. Susceptible plants collected from a field with no prior history of linuron use were all killed when sprayed at the lowest dose rate recommended, 1.125 kg/ha. The herbicide-resistance ratio was 29.0 for linuron, and for cross-resistance to atrazine, the ratio was 1.3, indicating that these plants exhibit greater resistance to linuron than to atrazine..
Papanikou, E. ; Brotherton, J. E. ; Widholm, J. M.. 2004. Length of time in tissue culture can affect the selected glyphosate resistance mechanism. Planta 218 : 589 - 598. Usually, stepwise selection of plant suspension cultures with gradually increasing concentrations of the herbicide glyphosate results in the amplification of the target enzyme 5-enolpyruvylshikimate-3-phosphate synthase (EPSPS; EC 2.5.1.19) gene that leads to resistance by increasing EPSPS mRNA and enzyme activity. We show that glyphosate selection with newly initiated suspension cultures can produce resistant lines with resistance mechanisms other than gene amplification and that usually as the cultures age gene amplification becomes the predominant mechanism. Gene amplification did not occur in 3 lines selected from 5-month-old Datura innoxia [D. fatuosa] Mill. cultures but did occur in all 10 lines selected after 52 months. Selection with Nicotiana tabacum L. (tobacco) less than 5 months old produced 2 lines out of 24 with no EPSPS amplification while all 17 lines selected from older cultures contained amplified genes. Lines selected from the oldest culture (35 years) also exhibited amplification of several different genes, indicating the expression of different EPSPS genes or an enhanced gene amplification incidence. None of the 15 lines selected from 2 different 5-month-old Daucus carota L. (carrot) lines exhibited amplification while amplification led to the resistance of all 7 lines selected from one of the original carrot lines (DHL) after 3 years. However, the other line (Car4) was exceptional and produced only non-amplified lines (9 of 9) after 8 years in culture. These results show that plant tissue cultures change with time in culture and that several different new mechanisms can result in glyphosate resistance..
Chen, W. P. ; Punja, Z. K.. 2002. Transgenic herbicide- and disease-tolerant carrot (Daucus carota L.) plants obtained through Agrobacterium-mediated transformation. Plant Cell Reports 20 : 929 - 935. Transgenic carrot (Daucus carota) plants expressing a rice thaumatin-like protein (tlp), phosphinothricin acetyltransferase (bar), and the hygromycin phosphotransferase (hpt) genes were obtained by Agrobacterium-mediated transformation. Petiole and hypocotyl segments of three carrot cultivars (Nantes Coreless, Danvers Half Long and Nanco) were used as the explant sources. Following infection, selection was achieved on Murashige and Skoog medium with 1 mg phosphinothricin [glufosinate]/litre or 25 mg hygromycin B/litre, which was increased after 2 weeks to 10 mg phosphinothricin/litre and 100 mg hygromycin B/litre. The presence of the tlp and bar transgenes was confirmed by polymerase chain reaction and Southern blot analyses, and the expression of the thaumatin-like protein was demonstrated by Western blot analysis. Among 45 primary transformants, 13 were selected for assessment of herbicide and/or disease tolerance. The transgenic plants showed varying levels of tolerance to the herbicide phosphinothricin, depending on the transformation events in different lines. Four transgenic lines also showed significantly enhanced tolerance to the foliar and root pathogen Botrytis cinerea or Sclerotinia sclerotiorum when inoculated under controlled environment conditions. Two lines had significantly enhanced tolerance to the herbicide phosphinothricin as well as to both pathogens. These results demonstrate the feasibility of introducing two potentially useful agronomic traits into carrot through genetic engineering..
Stachler, J. M. ; Kells, J. J. ; Penner, D.. 2000. Resistance of wild carrot (Daucus carota) to 2,4-D in Michigan. Weed Technology 14 : 734 - 739. Differential response of wild carrot to 2,4-D was found in seeds collected from 10 locations in Michigan, three in Ohio, one in Illinois, and one in Ontario, Canada, in 1993-94. Greenhouse studies were conducted on plants grown from the collected seeds to confirm resistance of wild carrot to 2,4-D, and to study variations among and within populations. The differential response of wild carrot to 2,4-D in field research was due to resistant individuals. Among the 14 locations, wild carrot control with 2,4-D ranged from 18 to 91%. Wild carrot varied in its response to 2,4-D among and within populations as well as within individual umbels. 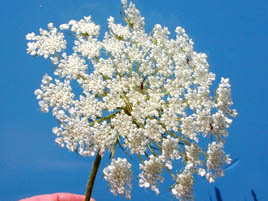 In 69% of the tested samples, at least one wild carrot plant was resistant to 2,4-D..